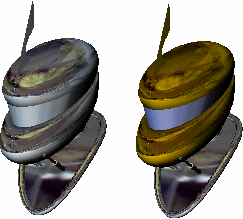 The EMap command visually evaluates surface smoothness using an image reflected in the surface. In the Environment Map Options dialog box, select an image file to use for mapping. Displays environment images used in the model. Browse for an image to use. This blends the image with the render color of the object, which lets you simulate different materials with the environment map. To simulate different materials, use a neutral colored bitmap and blend with the object render color. Turn on environment mapping analysis for additional selected objects. Turn off environment mapping analysis for selected objects. The EMap command is one of a series of visual surface analysis commands. These commands use NURBS surface evaluation and rendering techniques to help you visually analyze surface smoothness, curvature, and other important properties. If, when you use the EMap command, any selected object does not have a surface analysis mesh, an invisible mesh will be created based on the settings in the Polygon Mesh Options dialog box. The surface analysis meshes are saved in the Rhino files. These meshes can be large. Both the RefreshShade command and the Save geometry only option of the Save and SaveAs commands remove any existing surface analysis meshes. Environment mapping is a rendering style that makes it look as though a scene is being reflected by a highly polished metal. There may be a few cases in which environment mapping actually shows a surface defect that can't be seen when you use Zebra and rotate the scene. Images for environment mapping are created by photographing a reflective sphere in various environments. Manipulating a flat image to be round using a paint program does not work, for this procedure doesn't capture the whole environment. To better understand why, find something (anything) that's reflective and look at the reflections carefully. A chrome toaster, or some other approximately spherical object, will aid your understanding especially well. As you look into the center of the object you will see yourself. But as you look toward the edge of the object (where the surface normal is almost perpendicular to the direction you are looking) you will see that the reflected object is almost exactly behind the object you are looking at. The result is that a reflective sphere shows a distorted view of the entire scene around it - in front of, beside, and behind the sphere. All reflective objects do the same. A photograph, on the other hand, shows only a small portion of what is in front of the camera, which is not even close to a 360 degree view. You can use a fish-eye lens to get a closer approximation, but you still only get a 180 degree view at best. There are some software programs that will take a series of panoramic photos (take them by putting your camera on a tripod and rotating the camera until you get shots of everything around the camera) and combine them into a spherical map. The EMapOff command turns off environment map display.